What is it? – Laserworx is a clever, cranium-scrambling puzzle game where you need to redirect beams of light so that they highlight all of the nodes in each level. Who made it? – The game was developed by Liszkay Games. How does it play? – Each level contains a certain number of nodes that are activated when a beam from one of the given laser sources passes through them. A simple point, click, and drag control scheme allows you to easily reposition the laser sources. 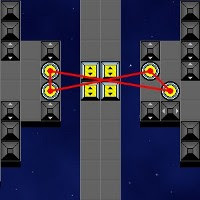 These “laser nodes” are connected in groups of two or more, meaning that you’ll often have to manipulate two (or more) laser nodes to achieve the desired effect. Each level has a different playing field and node positioning, and some of them even include regular nodes and wall-sections that can be moved in the same way as the laser nodes. Some of the nodes will also begin in their highlighted state, which means that you’ll have to keep the lasers beams from coming in contact with them. Presentation – It’s not very intricate visually, but given that some levels will have you moving around a ton of different nodes, the graphical simplicity is quite welcome. The spacey background music and sound effects are excellent though, and compliment the sci-fi look and feel. Positives – One hundred deviously-designed levels will keep you puzzling for quite a while. Some of the puzzles are quite tricky, but the lack of a level timer allows you to think things through at your own pace. Negatives – It’s not likely you’ll finish the game in one sitting, and some of the tougher puzzles may lead to frustration. Why you should play it – Laserworx is one of the more robust and craftily-designed puzzle games to come around in a while. The puzzles are unique and rewarding to complete, and the experience still manages to be very accessible to a wide variety of player dispositions. I highly recommend giving it a shot, but you should be sure to bring your brain along for the ride.